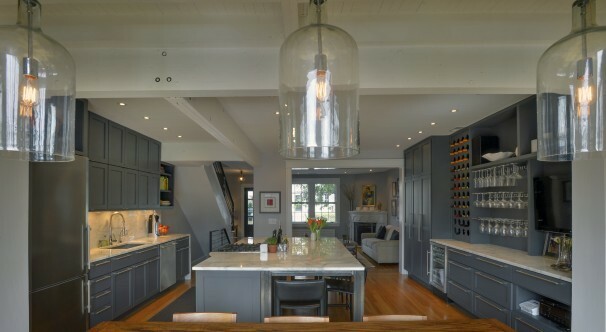 In Mount Pleasant, Washington D.C., rowhouse homeowners Lydia Pelliccia and Craig Schumpert transformed their narrow, dark galley kitchen into a spacious, family-friendly kitchen. The kitchen renovation includes Top Knobs decorative hardware and was featured in The Washington Post. “We cook a lot for ourselves and entertain fairly regularly, and we wanted stuff within reach,” says Schumpert. “We wanted to be able to minimize clutter and didn’t want to bump into each other all the time when cooking.” He and Pelliccia wanted to be able to prepare dinner while having their daughter, Lola, 9, sitting nearby doing homework. Interior designer Carmel Greer of District Design removed the interior walls on the main floor and expanding the kitchen to the full width of the house, placing the living area in front and the dining area in back. The kitchen is now the centerpiece of this house, and light floods in from both directions. Top Knobs Pennington Bar Pulls grace this Maryland kitchen. Greer accented the lower cabinets with Top Knobs Pennington bar pulls in Brushed Satin Nickel. 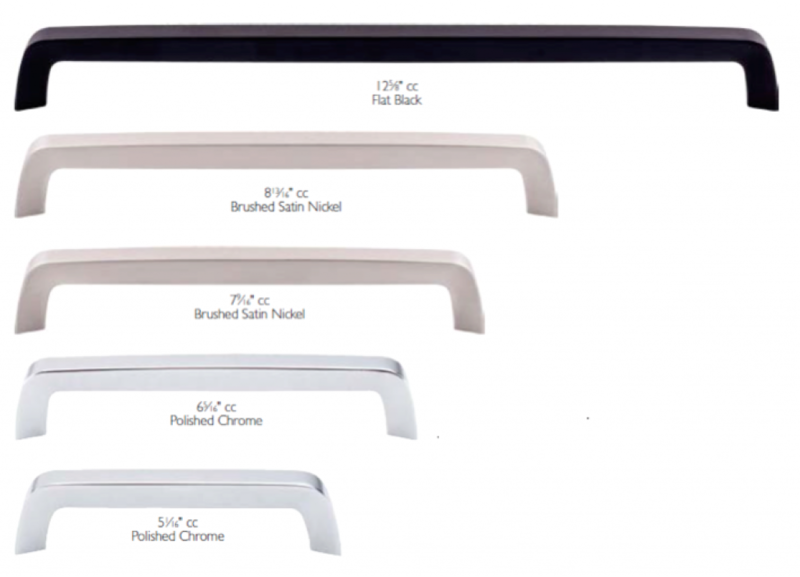 The contemporty bar pulls are available in 11 sizes, from 3″ to 37 3/16, and in five finishes, Flat Black, Brushed Satin Nickel, Polished Nickel, Oil Rubbed Bronze and Polished Chrome, to match a variety of decors. Read the complete article on The Washington Post. 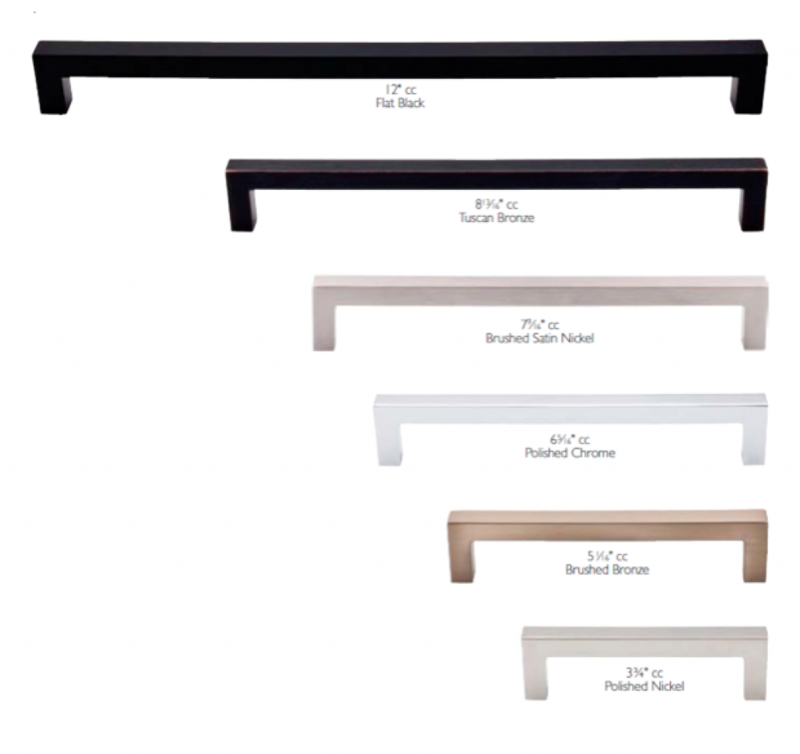 The popular Top Knobs Bar Pull collection has expanded to include additional sizes from the Nouveau III collection. Square and tapered bar pulls are now available in multiple sizes and finishes to fit a wider array of projects and cabinetry. Top Knobs Nouveau III collection is perfect for those who desire contemporary, yet minimalistic style. The modern shapes with sleek and strong lines make the collection the perfect addition to the bar pull family. Additional sizes make it even easier to integrate into any kitchen project. Like all Top Knobs products, the Bar Pull Collection comes with a lifetime warranty. For more Top Knobs news and projects, visit follow us on Facebook, Twitter, Pinterest and Google+. 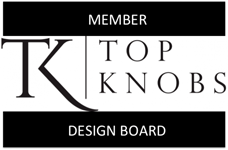 Top Knobs was recently featured in a Houzz article written by contributor Becky Harris. 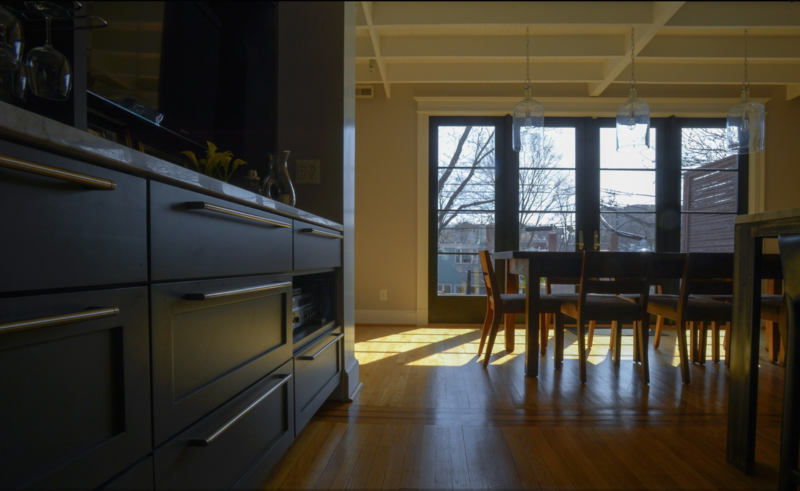 The article entitled, “Family Kitchen Smartens Up With a New Ecofriendly Renovation” features a family with a passion for sustainability in Portland, Oregon. 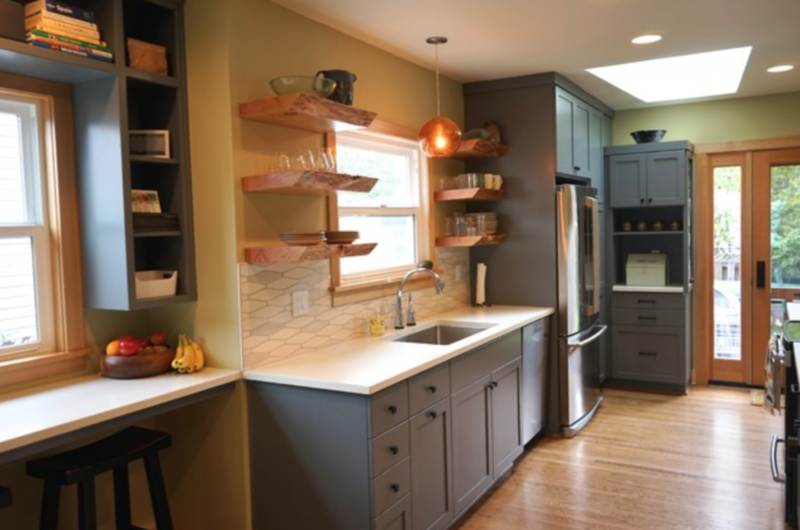 The family hired Encircle Design and Build to help convert their kitchen into an ecofriendly space with some help from Top Knobs cabinetry hardware. Before the transformation, the kitchen seemed disconnected to the rest of the house due to the dated cabinetry and wall colors. Because of limited cabinet space, pots and pans hung from the ceiling and clutter filled the countertops, making it an unfriendly environment for their two young children who loved spending time in the kitchen. 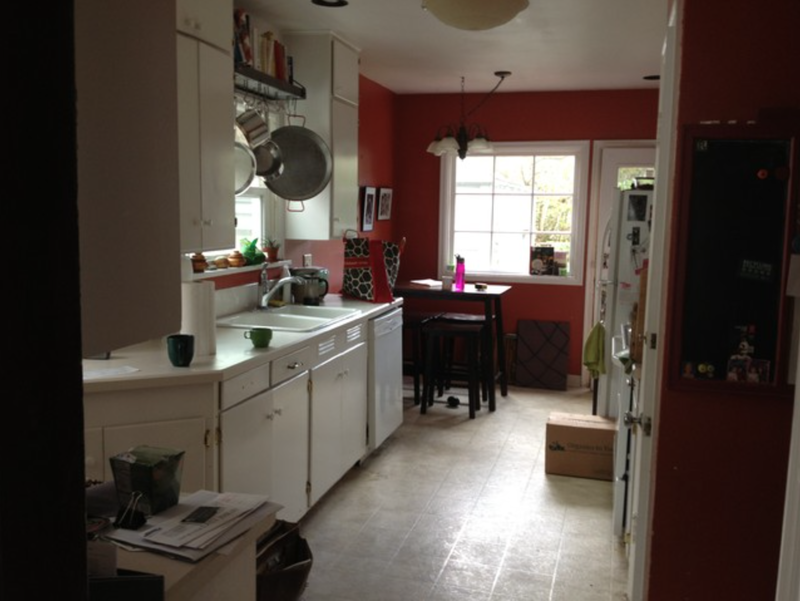 The new countertops that were installed were 30 inches wide instead of the original 12. New corner cabinets and a wraparound countertop allowed for additional storage space and a place for the children to finish their homework while their parents cooked. To complete the look, designers used Top Knobs Square Knobs and Bar Pulls from the Nouveau III collection. The Square Knobs are 5/8″, while the Bar Pulls are 5 1/16″. 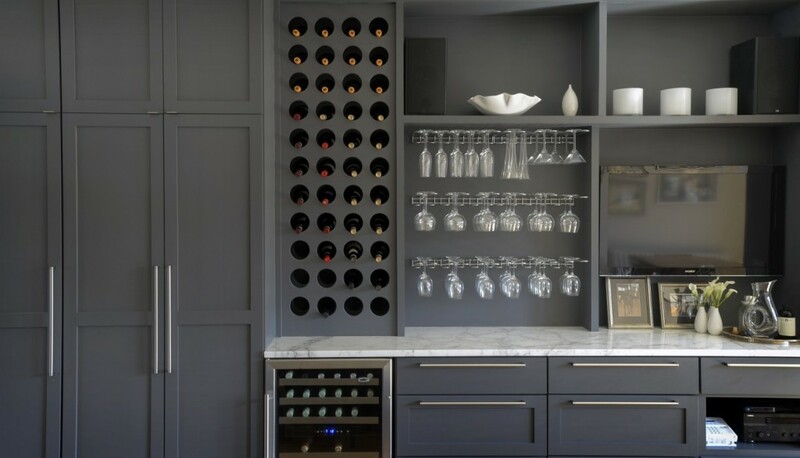 The flat black finish accented the blue cabinetry perfectly, giving it a modern yet homey look. To fulfill their promise of sustainability, all previous appliances were donated to a homeless shelter while the salvageable wood was donated to another nonprofit. Any items that could not be reused were responsibly recycled. For more project featuring Top Knobs decorative hardware, follow Top Knobs on Houzz.